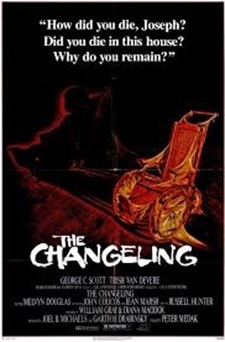 The Changeling is a classic ghost story–heavy on atmosphere and suggestive chills, light on gore and graphic violence. That’s not really how I usually define a scary movie, but every so often I see The Changeling mentioned as one of those “must-see” films for horror buffs. Having finally watched it, I understand the recommendation–in many ways I found The Changeling much more frightening than its bloodier cousins. There are no flashy effects, just well-done, haunted house smoke, mirrors and misdirection leading us deep into the central mystery. And with those simple tools, The Changeling creates a quiet, reliably creepy cinematic experience. When The Changeling was released in March, 1979, the face of horror was already beginning to shift to the slasher-heavy pantheon of Jason, Michael, and Freddy. The low-key story instead revolves around the emotional toll of loss, greed, and betrayal–and with its ghosts and tragedy The Changeling shows that the old terrors still have plenty of power. The film’s pacing is measured, driven by the characters’ interactions and underscored with the expected ghostly effects. And it shows a remarkable sensitivity to its characters’ emotional states. Men cry in this movie, because they love, and they get hurt. It is somewhat surprising to see, but brutally honest to watch. 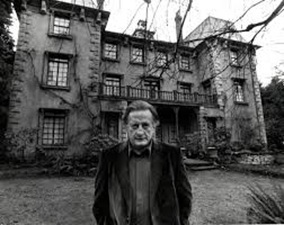 George C. Scott is the star of the show. He plays John Russell, a grieving widower trying to move on with life after losing both his wife and daughter in a tragic accident. To escape his loss Russell leaves New York for Seattle, and ends up renting a sprawling old gothic mansion that has stood empty for the past dozen years. Russell’s haunting begins almost immediately with small things–odd noises, doors closing, the feeling of another presence in the house. At times there is a loud metallic pounding that might be the pipes, or the furnace. Or not. 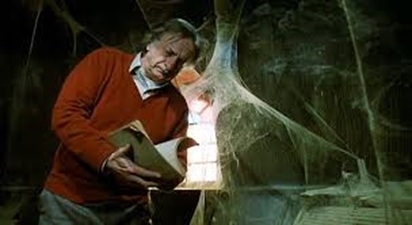 All the customary horror movie trappings appear in The Changeling (even the few trite ones that do nothing but move the plot along), yet they are so well done that their familiarity does not dull their impact. This movie is scary. There is classic ghost story foreshadowing–“That house is not fit to live in…It doesn’t want people”—and an assortment of familiar tropes. In addition to the noises, there is a hidden attic room, with everything shrouded in thick cobwebs and shadows. There are visions of murder, and a deep, dark secret involving sickly children and shrouded identities. There is a persistent wet greyness to the film, and in the cold, wet city scenes there is an attention given to the isolation of crowds. The overcast skies lend to the oppression, and encourage the underlying sadness of the story. The film relies heavily on watery imagery in its haunting, from the rainy Pacific Northwest setting to running faucets, sinks and tubs, a river and the ocean, a hidden well, and the persistent vision of a drowned child. There are also echoes from other films, with certain scenes reminding me of the empty apartment in Last Tango in Paris and of the sweeping Manderley mansion from Rebecca. With all these fine details, The Changeling deserves its reputation as a top notch horror film. I could not keep from looking back over my shoulder as I watched it. Even though the effects are old-fashioned, without shock value or a single jump scare, the end result is chilling.